Retinoblastoma is the most common intraocular malignancy in children, with a reported incidence ranging from 1 in 15,000 to 1 in 18,000 live births. Metastatic retinoblastoma is rare in developed countries, with a reported range from 4.8% in the United States to 5.8% in the United Kingdom. However, the frequency reported from developing countries varies from 9 to 11% at presentation. The mortality is very high owing to late presentations, delayed diagnosis compounded by socio-economic factors. The management of metastatic retinoblastoma is evolving, but it is still a challenge in pediatric oncology. 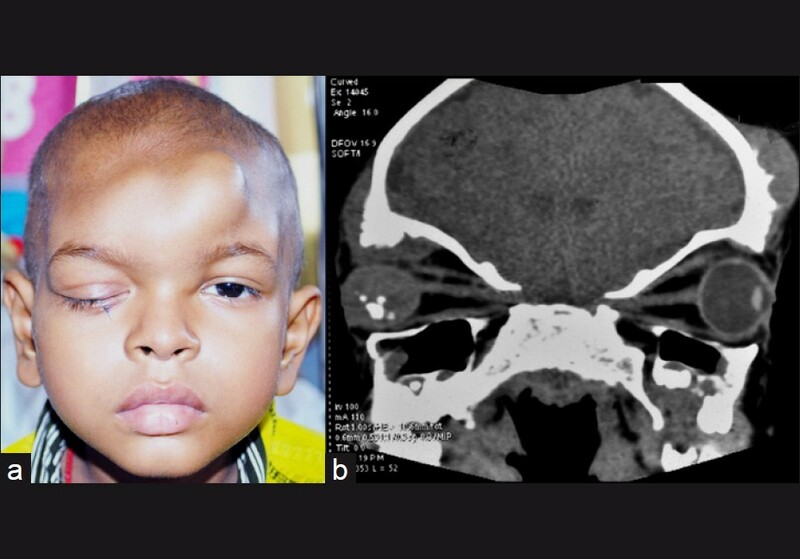 We present a case of an extensive skeletal metastasis that initially presented as a massive orbital retinoblastoma. Retinoblastoma is the most common intraocular malignancy in children, with a reported incidence ranging from 1 in 15,000 to 1 in 18,000 live births. Orbital retinoblastoma is one of the major contributors to mortality and carries a poor prognosis for life. ,,, The presence of orbital invasion is associated with 10-27 times higher risk of metastasis when compared to cases without orbital extension. ,, The frequency of metastatic retinoblastoma ranges from 4.8 to 11%. , The presenting signs and symptoms are quite variable and depend on the site or sites of involvement. The common sites of extraocular retinoblastoma include the orbit, preauricular nodes, bones, central nervous system (CNS) and liver. 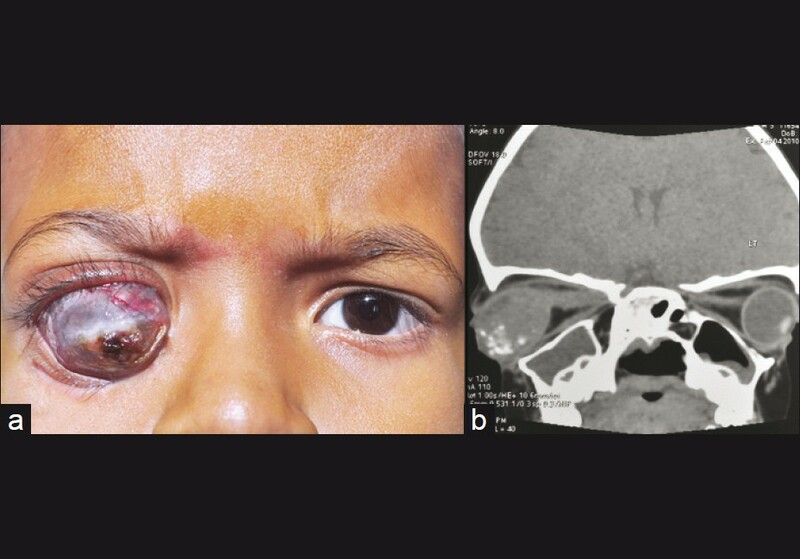 A 5-year-old boy presented with prominence of the right eyeball since the past 5 months. There was a past history of the parents noticing whitish reflex in the right eye since past 1 year. There was no positive family history. Examination under anesthesia revealed the right eye to have proptosis of more than 8 mm with extraocular mass, and anterior segment details were all obscured [Figure 1]a. The left eye anterior segment was normal and the fundus showed a 4 × 3 × 2 mm partly calcified tumor in the supero-nasal periphery and a 1 × 1 × 1 mm fully calcified regressed tumor in the infero-temporal periphery. Computed tomography (CT) scans were classical of a bilateral retinoblastoma with right eye extraocular and optic nerve extension. However, there was no intracranial extension [Figure 1]b. A systemic workup including bone marrow biopsy and cerebrospinal fluid (CSF) analysis was done. 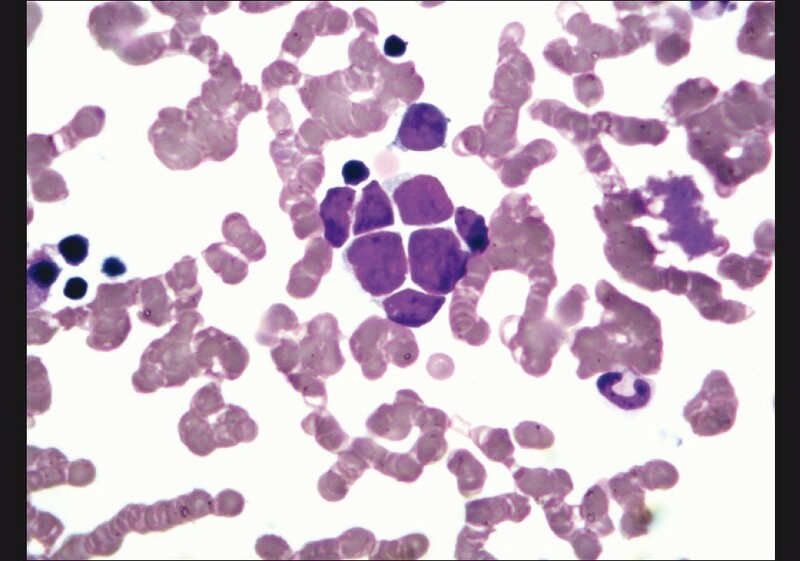 Bone marrow was positive for tumor deposits of malignant round cells. The cells were small with scant rim of cytoplasm and a round hyperchromatic nucleus with prominent nuclear molding. The CSF cytology was within normal limits. Based on this, a diagnosis of metastatic retinoblastoma stage IV a (distant metastatic retinoblastoma without CNS involvement) was made. The patient was started on a 3-weekly high-dose chemotherapy protocol with vincristine, etoposide and carboplatin (VEC regime). Following four cycles, the right eye proptosis resolved and there was atrophic bulbi with total vascularized corneal scar. The left eye tumor regressed completely. The patient was then lost to follow-up and again presented with mild proptosis in the right eye. Examination under anesthesia revealed right eye upper periocular edema and numerous firm and tender swellings on the forehead and scalp [Figure 2]a with large areas of thin scleral ectasia. Left eye was found to have regressed tumors. CT scans showed the right eye to have similar findings as noted in the initial visits, but in addition, there was diffuse heterogeneous mass involving the frontal bones and the superior orbits with diffuse, irregular bony erosions [Figure 2]b. Fine needle aspiration cytology (FNAC) of the forehead lesion, bone marrow biopsy and CSF analysis were done. Bone marrow biopsy and FNAC were positive for tumor deposits of malignant round cells [Figure 3]. The systemic condition of the child was poor. An impression of extensive skeletal metastasis was made and the patient is currently on a palliative chemotherapy with high dose of vincristine, etoposide and carboplatin. At current follow-up of 4 months following palliative therapy, the patient is stable. Retinoblastoma can metastasize to the regional lymph nodes, CNS and distant organs, usually the bone and bone marrow. CNS involvement is not only through optic nerve, but also can happen hematogenously. Accordingly, Jubran et al. suggested four patterns of metastatic retinoblastoma, each having different clinical features and outcomes: trilateral retinoblastoma, regional metastasis, extension into CNS and distant metastasis. The prognosis of metastatic retinoblastoma has been traditionally dismal. There is a lot of new encouraging literature suggesting that high-dose chemotherapy with autologous stem cell rescue is associated with improved survival for patients with distant metastatic retinoblastoma without CNS involvement, like in our case. The children's oncology group trials may help formulate a relatively effective strategy for the management of metastatic retinoblastoma, which still remains a challenge in pediatric oncology. Bishop JO, Madsen EC. Retinoblastoma: Review of current status. Surv Ophthalmol 1975;19:342-66. Cozza R, De Ioris MA, Ilari I, Devito R, Fidani P, De Sio L, et al. Metastatic retinoblastoma. Single institution experience over two decades. Br J Ophthalmol 2009;93:1163-6. Gunduz K, Muftouglu O, Gunalp I, Unal E, Tacyildiz N. Metastatic retinoblastoma: Clinical features, treatment and prognosis. Ophthalmology 2006;113:1556-8. Finger PT, Harbour JW, Karcioglu ZA. Risk factors for metastasis in retinoblastoma. Surv Ophthalmol 2002;47:1-16. Honavar SG, Singh AD. Management of advanced retinoblastoma. Ophthalmol Clin North Am 2005;18:65-73. Sanders BM, Draper GJ, Kingston JE. Retinoblastoma in Great Britain 1969-1980: Incidence, treatment and survival. Br J Ophthalmol 1988;72:56-583. Jubran RF, Erdreich-Epstein A, Buturini A, Murphree AL, Villablanca JG. Approaches to treatment for extraocular retinoblastoma. Children's Hospital Los Angeles experience. J Pediatr Hematol Oncol 2004;26:31-4. Dunkel IJ, Chantada GL. Metastatic retinoblastoma. In: Singh AD, Damato BE, Pe'er J, editors. Clinical Ophthalmic Oncology. 1 st ed. Saunders: Elsevier; 2007. p. 484-6. Meadows AT, Chintagumpala M, Dunkel IJ, Friedman D, Stoneer JA, et al. The Children's Oncology Group (COG) Trials for Retinoblastoma. In: Singh AD, Damato BE, Pe'er J, editors. Clinical Ophthalmic Oncology. 1 st ed. Saunders: Elsevier; 2007. p. 484-6. Dunkel IJ, Khakoo Y, Kernan NA, Gershon T, Gilheeney S. Intensive multimodality therapy for patients with stage 4a metastatic retinoblastoma. Pediatr Blood Cancer 2010;55:55-9.